In stock -This product will ship today if ordered within the next 14 hours and 27 minutes. Most experts recommend a good multivitamin when you are pregnant because it`s difficult enough getting all the right nutrients with our busy lifestyles, even when not expecting. 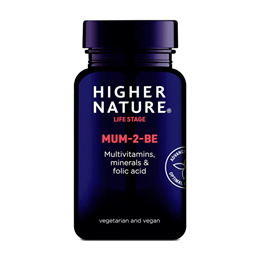 Mum-2-Be provides all the vitamins and minerals that are so important at this demanding time to support well-being, fertility reproduction, including Folic Acid. 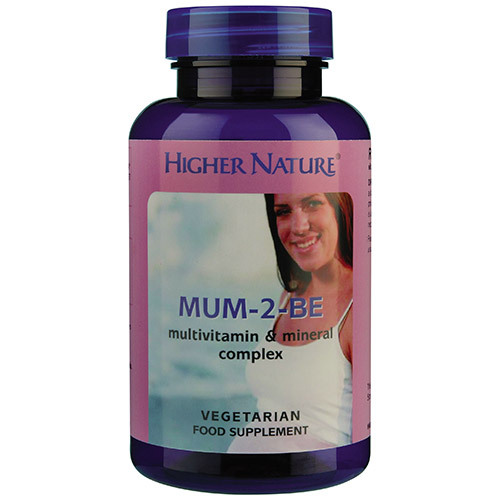 Mum-2-Be also contains True Food, Iron which is easily absorbed and gentle on the stomach. Additionally, a daily Omega 3 Fish Oil or Flax Seed Oil is also recommended, as are additional Calcium and Magnesium for healthy teeth and relaxed muscles. CONTAINS NO added salt, wheat, gluten, lactose, dairy products, artificial preservatives, colours or flavourings. Natural Lithothamnion calcarea, bulking agent: mirocrystalline cellulose; magnesium citrate, calcium ascorbate (bulking agent: hydroxypropyl methylcellulose), magnesium oxide, calcium citrate, magnesium ascorbate, calcium pantothenate, enzyme pre-digested iron fermented with Saccharomyces cerevisiae (with soya), nicotinamide, natural kelp powder (fish, crustacea), thiamine hydrochloride, d-alpha tocopheryl succinate, choline bitartrate, coating: hydroxypropyl methylcellulose, riboflavin, zinc citrate, anti-caking agent: stearic acid*; anti-caking agent; silicon dioxide, inositol, anti-caking agent: magnesium stearate*; betacarotene (carrier: potato starch; antioxidant: dI-alpha tocopherol). manganese citrate, pyridoxine HCI, sodium borate, biotin**, ergocalciferol prep., l-selenomethionine, folic acid**, cyanocobalamin**, vitamin K1 (stabiliser: surcose), chromium picolinate. copper citrate, *(vegetarian source), **(natural Lithothamnion calcarea. Pregnant women take 3 tablets a day, 1 with each meal, or as your health professional advises. Daily Omega 3 Fish Oil or Flax Seed oil are also recommended as are additional Calcium and Magnesium for healthy teeth and relaxed muscles. Below are reviews of Mum-2-Be - Pregnancy Supplement - 90 Tablets by bodykind customers. If you have tried this product we'd love to hear what you think so please leave a review. Most experts recommend a good multivitamin when you are pregnant. Mum-2-Be provides all the vitamins and minerals that are so important at this demanding time to support fertility and reproduction, including Folic Acid.